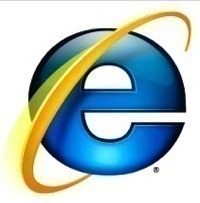 Internet Explorer Stored Password Recovery refers to a system used by Internet Explorer to temporarily store usernames and passwords for the user’s convenience. Internet Explorer Stored Password Recovery is used for AutoComplete purposes in order to automatically fill in user identification fields whenever the user visits a previously accessed webpage. While Internet Explorer Stored Password Recovery is able to store the user’s usernames and passwords for a variety of websites, it may or may not ask the user to remember his/her information. In most cases, Internet Explorer Stored Password Recovery will remember the user’s usernames, but not his/her passwords, allowing the user to forego entering his/her username but still requiring the user to verify his/her identity. Internet Explorer Stored Password Recovery works by storing the user’s information in a series of registry keys known as “Windows Protected Storage”. While the user does not have direct access to these registry keys, Internet Explorer is able to retrieve the user’s information from these files whenever it runs. Particularly, when a user visits a specific website, Internet Explorer will retrieve his/her information for that website from a registry key of the same name. 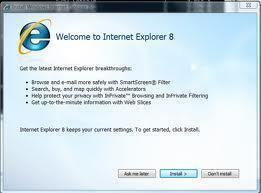 Internet Explorer will then display the information in a list and allow the user to select the appropriate data. Internet Explorer Stored Password Recovery can be accessed, controlled, and enabled/disabled in a variety of ways. For example, users can choose which information Internet Explorer stores by opening Internet Explorer, selecting Tools, Internet Options, Content, and AutoComplete. From here, the user can check or uncheck boxes for web addresses, forms, and usernames and passwords. The user can also tell Internet Explorer to prompt him/her before saving passwords, clear form data, or clear password data. 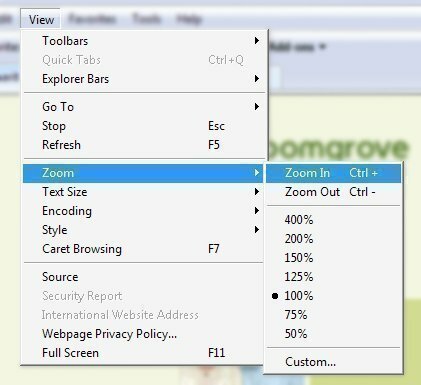 Another way to disable Internet Explorer Stored Password Recovery is to simply disable Cookies by opening Internet Explorer, selecting Tools, Internet Options, Security, clicking on the Globe icon, and selecting the Custom Levels button. From here, the user has a wide variety of options for enabling/disabling cookies as well as changing cookie settings. However, disabling cookies may prevent users from being able to access some websites. To prevent this, the user could simply delete his/her web history and/or temporary files frequently by opening Internet Explorer, selecting Tools and Internet Options, and clicking the Delete button under Browsing History. From here, the user can delete his/her web history, temporary files, passwords, form data, and a variety of other stored data. 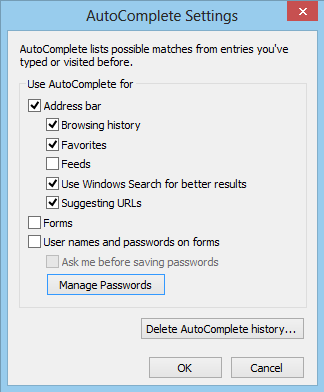 To see which usernames and passwords are already stored and access them click on the Manage Passwords button in the AutoComplete Settings window. You should get a list of saved credentials and click to see them. Windows may ask you for your Windows password before it shows you the stored password. Thanks for the refresh.. lol I totally forgot ! So simple when you know how. Thanks. PLEASE HELP I CANT ACCESS MY ACCOUT. If you’re using Internet Explorer try Internet Explorer Password Recovery Master. When you run it, it will show you the passwords among other secret data stored. See the screenshot on that page. If you’re using Firefox go to preferences, security tab and click on the “saved passwords” button, and then “show passwords” to reveal them. 135 queries in 0.285 seconds.